At this time I am currently only donating to groups which I have worked with or donated to in the past on a case by case basis. And of course, my own group which I started volunteering for so many years ago receives the bulk of my donations. 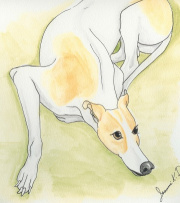 I have been involved in this wonderful greyhound community since 1994 when I adopted the first of my nine greyhounds and began fostering shortly thereafter. I wish that I could help each and every group and individual who is striving to find permanant homes for retired racers. However, Dragonflyte Creations is an extremely small and privately owned company in which funds are limited. Yes, it does cost me money to make the things I am asked to donate. And no, I don't always get to write off my donations on my income tax. If I were to respond to every request I received for donations, I would soon be out of business.